The students of Class 1-A learn about work studies from the Big Three. Meanwhile, the villains also prepare their next steps. The world has changed for villains and heroes alike in the weeks after All Might's fight with All For One, and the U.A. students start their second semester. Following the provisional licensing exam, Izuku tries out his Shoot Style on Bakugo as they have a heart-to-heart through their fight. People are not born equal, a realization that 4-year-old Midoriya Izuku faced when bullied by his classmates who had unique special powers. Izuku was one of the rare cases where he was born with absolutely no unique powers. This did not stop Izuku from pursuing his dream, a dream of becoming a great hero like the legendary All-Might. To become the great hero he hopelessly wants to become, he now will join the ranks of one of the highest rated "Hero Academies" in the country: UA. With the help of his idol All-Might, will he be able to claim the ranks and become a true hero? 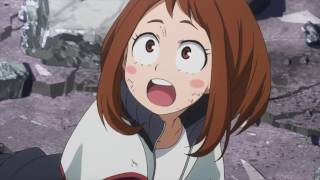 Currently you are able to watch "My Hero Academia" streaming on Netflix.